« Another Flowers in Watercolour Masterclass! A pilot Thursday evening lecture- Jilli Blackwood at Off the Rails Arthouse. Jilli will talk about the relationship between herself and the textile. Her confidence, courage, inspiration, motivation and over coming self – doubt. Jilli Blackwood is an internationally renowned textile and fibre artist and designer who creates embroidered and woven paintings. She is an award-winning graduate of the renowned “The Glasgow School of Art”, achieving a First Class BA Honours Degree in Art and Design. Jilli’s contemporary embroidery style has gained international fame through her many major design projects. Among other projects, she has been commissioned to work on public art commissions, global performance ceremonies and design projects. 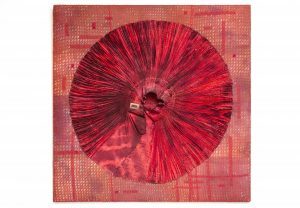 Her textile installations are held in notable museum, public, corporate and private collections worldwide. Jilli has been Artist-in-Residence at the National Museum of Scotland in Edinburgh. She is regularly invited to lecture internationally on her work and to teach, most recently in California, USA. Please book your seat for the lecture- £5.00 on the door.